Last spring, in early June, we got new neighbors. 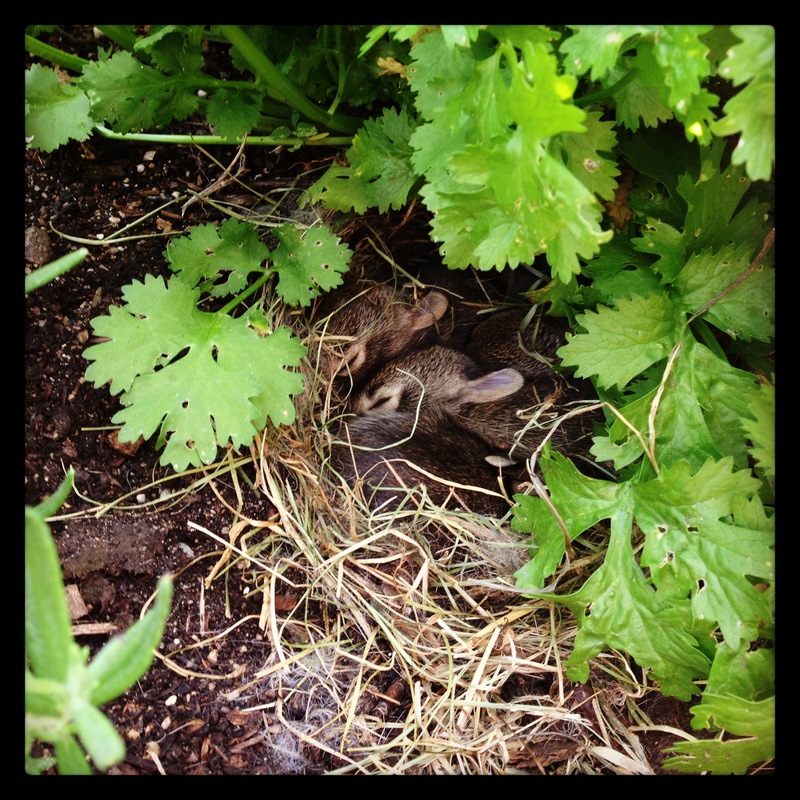 A bunny decided to have her babies in our herb garden, right under the parsley. It wasn’t really an ideal site for a bunny family: The herbs and lettuce hadn’t really grown in yet, so the nest seemed very exposed to us. Not to mention the fact that Bronwen-the-dog is out there all the time. And my neighbors’ cat, who is a known threat to wildlife (we’ll just refer to the proof as the Chipmunk Massacre of 2011 and leave it at that). We called the Humane Society and they told us just to leave it, unless there was immediate danger. Young bunnies need their mom, she wouldn’t forget them and nature would take its course. So we left them. And about four weeks later, they’d gone from being slimy little gray things to pretty cute fluffy babies. I don’t think Bron ever realized they were there. Or if she did, she didn’t care. I kept a close eye on her those three weeks (which was a bit of a pain, actually), but she never touched them. At one point, we think the count went down from six bunnies to five, but it’s hard to count when they were always in a snuggly pile. And, despite the fact that they were living in the garden, they didn’t eat anything, which was pretty nice. All-in-all, the upstairs neighbors and I were really enjoying watching them grow. Now, my very pregnant neighbor was probably more upset by this than she normally would have been, due to hormones. She was extremely distraught. But it was really sad to come outside in my pjs and see that the nest was completely empty. We weren’t sure if they’d run for it, or if the cat had somehow carried them all away. We all had flashlights, and I scanned the grass and spotted one. We decided that this situation was an immediate threat, so we picked up the baby and put it in a shoe box. Then we spent the next two hours, in the middle of the night, out in the backyard with flashlights, looking for the other four bunnies. (Again, upset neighbor a huge factor here. I’m not sure I would have searched for survivors so long if she hadn’t been there.) Eventually, we found three. We also found a possum (which is a freaky thing to catch in your flashlight beam), saw a raccoon cross the alley and had a close (but not too close) encounter with a baby skunk. 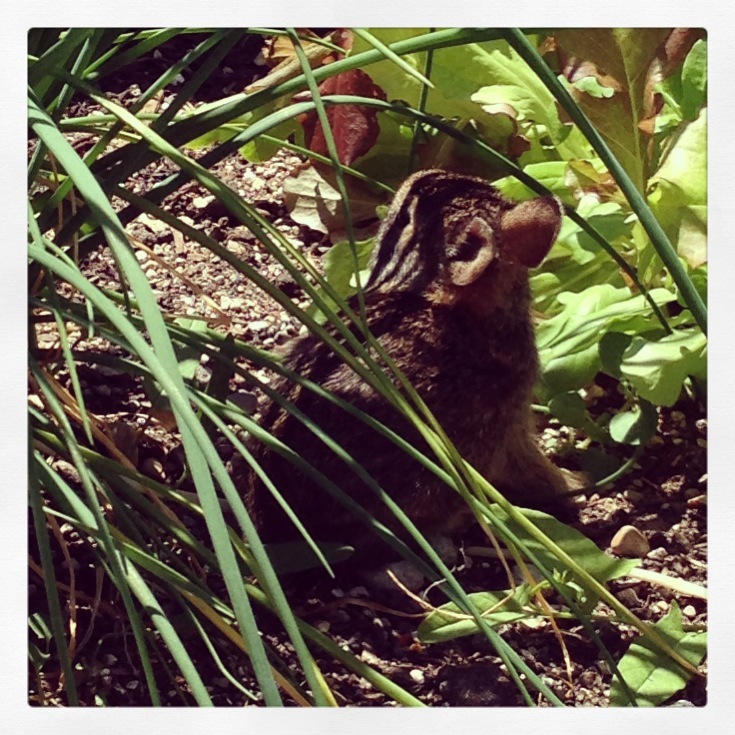 Apparently our yard is a wildlife hangout. 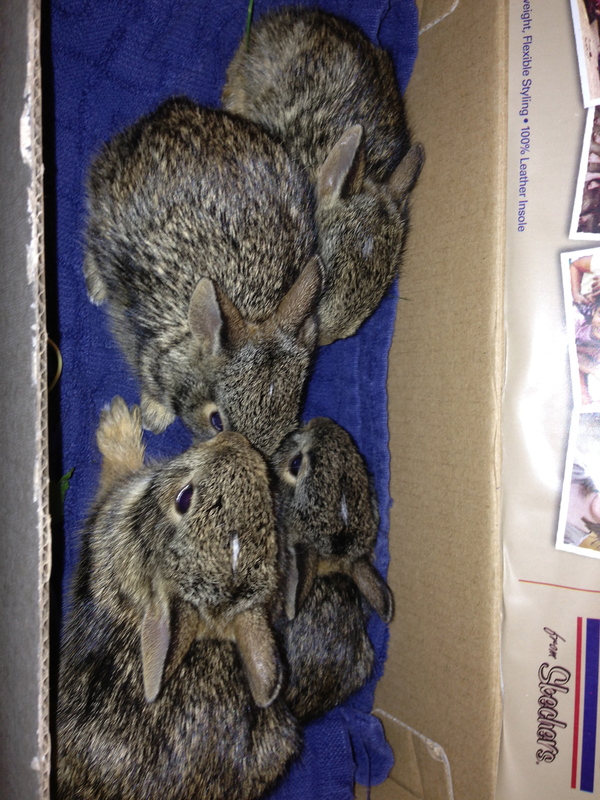 The neighbors took the bunnies to the Humane Society the next morning, where they were deemed really healthy and actually very big for their age and ready to be separated from their mom. They told them to put them back in the nest, and that their mom would either come back for them or they’d make their own way. The fact that they’d scattered when attacked showed they already knew their best defense mechanism. When I came home from work that day, I could see them hanging out in the yard. And that was the last time I saw them. I went out for the evening, and my upstairs neighbor looked out her window at dusk and saw that the momma had come back. She told me they were playing around, jumping in and out of the raised bed and chasing each other, and then they all ran off into the sunset. As fun as it was to watch the babies grow, it was also a little bit stressful. I had to watch my dog every second she was in the yard (which is fenced, so she normally doesn’t need super attentive watching like that). I wondered whether all those herbs I’d just bought and planted would survive. 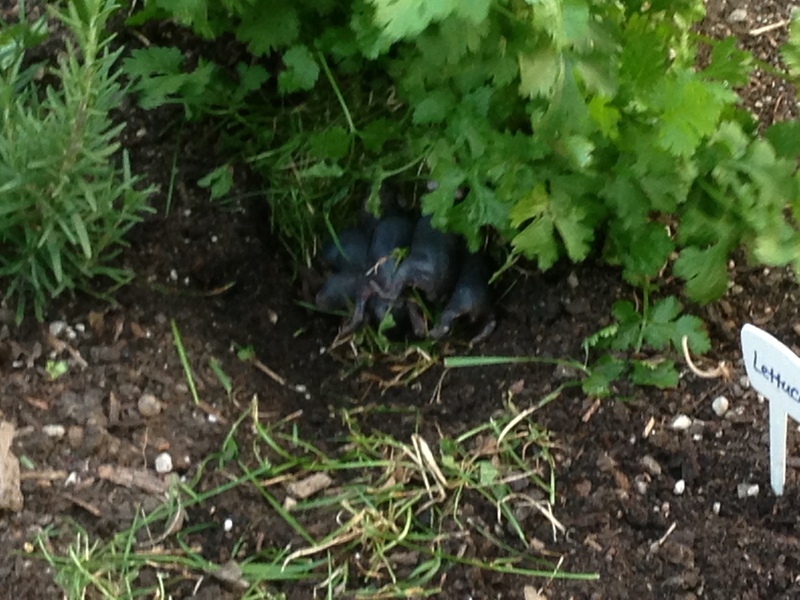 And I worried that I’d come out and find a dead bunny on the walkway (which would be both sad and gross). So this year, I’m looking into ways I can prevent animals from calling the garden home. I’ve considered fences and possibly those scary owl things. Or maybe a bird mobile? Now, if only I could figure out a way to keep that cat out of the yard.